As organizations continue to virtualize their infrastructures to gain higher levels of operational efficiency, VM sprawl and resource utilization are two key factors that can quickly create havoc for IT administrators. 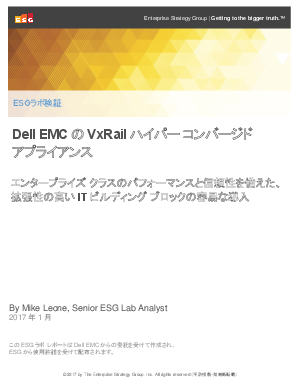 This ESG Lab Validation report documents the results of recent hands on testing of Dell EMC’s VxRail hyper-converged appliance powered by Intel® Xeon® processor. Testing focused on deployment simplicity, manageability, simple scale-out functionality, performance, and reliability.